1. Go to https://intensedebate.com/home and either Sign Up if you are new or Login if you already have a account. It contains all the options related to type of login that you allow , like the Facebook login , Twitter login ,etc . Also there are options for enabling Subscribing to the comments , threaded comments , voting on each comments , etc. This is one of the biggest reason why people shift to Intense Debate . It allows installing custom plugins in the Commenting system itself. The most used one is the Comment Luv plugin . Other plugins like ReTweet button for each comment and PollDaddy polls are also available. Hope this tutorial helps you in installing Intense Debate on Blogger , If you are using a highly customized template then these steps might fail to work , In that case I would be glad to help you setting it up on your blog . Thanks for the valuable info, Prayag! Do you mean to say that installing this plugin will enable the comments on Facebook and other social networking sites also to appear on the blog? I am a freelance writer with no technical background and I set up my blog recently. Am always on the lookout for tips to improve my blog and blogging skills. Will you please reply? interesting, but does it really work...and is it really worth it, or is it like the rest of these blog sites? Pryag..Please guide me if there is any effect on blog with a better service like disqus which have high PR and traffic ranking then Intense Debate. How will i select a service?? There will be no effect on your blog in any way , by choosing either Disqus or Intense Debate. Their rankings and PR are only effective in their site and no Search engines prefers any one of them over the other . Choosing a service is wholly dependent on you , it should be according to your needs. Thank you. I've been looking for a way to show Intensedebate on mobiles. The problem I've had is that when someone comments with the Blogger system from their phone is that Intensedebate will then not show up on that post anymore at all. Now it's perfect. hank you again. this is really a nice article about intensedebate installation. id is not only good for blogger but i would select the same system for wordpress. Thank you for resolving the mobile view issues for me! And How To install if i am using a custom domain in blogger? Should i use primary .blogspot address or the domain address?? 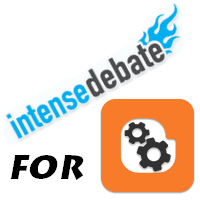 I've been using Intensedebate for a few months and used the custom mobile setting and it worked just fine. Last week I noticed that when I try to read one of my blogposts on my phone, it goes to the next post when I start scrolling instead of going to the end of the post. This doesn't happen with the other mobile themes, only the custom setting. DO you have any idea why this might happen? Thank you. Thanks for the easy to follow tutorial. I have installed it in my blog. Thank you again. hello, can you help me out! when some comments on my blog, I can check comments only in intensedebate account. It won't appear in my blogger panel, why so? how to make it to appear in blogger dashboard, pls help me!! It won't appear on your blogger dashboard, because it's not a blogger service. I checked your blog Himanchal , the IntenseDebate Comments are showing correctly in your blog. Are you facing any other problems ? Hi Prayag, Thanks for this wonderful tutorial. I have a few queries and hoping that you will help me. - I have checked (login via facebook) but it doesnt appear. - It asks to comment as intense debate or wordpress (doesnt give the option of google, openid). - Just curious why is it you have not installed this or may be gone back to blogger style?